We are a paramount and prime front-end development company, having an expert team of front-end professionals. Being focused on the UI, our front-end experts have a deep understanding of the usability and web design principles. They ensure best in class and innovative outcomes that not only enhance branding, but also foster ROI. Our front end developer provides communication support through phone, chat, Skype, E-mail, and PMS. We offer a striking package that includes full-time, weekly and bucket hours TM support. Our packages starting with just 8 hours per day going up to 168 hours per month within the period of 21 working days. The weekly hiring consists of 40 hours within a week. In bucket hours, you will have flexibility of hiring for full one year. Based on your requirement, you can select the best hiring plan. We render different tools for project trackers such as Trello, BaseCamp, Daily reports, Jira, PMS, etc. These astonishing factors pull our company up to be counted as the perfect place to hire frontend developer. Get collective & immensely dynamic web pages outcome in steep performance applications, we help you create a rich and interactive website to validate your business idea. We make use of top-notch technologies and frameworks to design your website and ensure that your web application is robust and responsive. Our dedicated frontend professionals will learn the ins-and-outs of your codebase for faster go-to-market including usability assessment, analysis and services. With our expertise in AngularJS, ReactJS and VueJS, we resolve the different challenges like multiple frameworks, single-page applications, cross-platform applications, and various architectures. Our frontend expert works closely with you to seamlessly integrate the front end UI into your web application be it Ruby, PHP, Java, etc. We accord the sophisticated architect and design to the frontend of a website giving our users amazing experience with dynamic tools & techniques. We keep updating our developers with the latest frontend web development technology to make your web application attractive for better user experience. Our toolkit is efficacious with the latest technologies and we always adopt new trends which can bring more-valuable outcome for your product. HOW WE ARE THE BEST PARTNER TO HIRE! Our developers work with absolute integrity of information, product, code, numbers for providing the best and secure service to your website. For frontend development process, we render seamless communication & complete transparency of activities to make long-term relationship with our clients. We offer various frontend tools to fix errors, code conversion, to get a report of sales, and product review report. We offer legitimate web & software frontend application services in less span of time to enhance the performance of your website. We provide data confidentiality and full code hand over through non disclosure agreement driven contracts and ensure that your project is safe for development process. Working exclusively with Front end development to provide on-time delivery through scheduled run & stay assured on what gets delivered. Through our experienced frontend professionals, we offer flexible services for compliance driven to fulfill the need of your business and grow it unconditionally. Our developers code perfection on the pixel level that is utilized to its fullest to create a sharp, coherent and clean look for your website. Our developers ensure the compatibility of web application in different browsers, different operating systems, and different devices to run it explicitly. To encourage the further improvements and help with the requirements, we use Front-End Code Standards that are separated into the requirements which should be testable. By using variety of frameworks, we provide real-time chat apps that are integrated with your website to convert a visitor into a customer. We offer economical website at reasonable price with decent cost saving, no hourly cost and fixed markup strategies while maintaining quality. Using security standards, our frontend professionals create secure website through complete visibility and control into the progress to protect from unauthorized users. Our frontend developers maintain the symmetry of work delicacy for providing a secured and productive result to get the attention of client. We provide end-to-end maintenance and support services to facilitate quick adoption and implement immediate fix for bugs. We use a systematic process of determining whether a product or service meets specified requirements to increase customer confidence and a company's credibility. Are you planning to build a website or you want to renew your website then discuss your project requirement with us. We will recommend the best suited frontend developer. To avail this service, fill all the relevant information or you can attach your requirement then click send. Once we receive your requirement then we will evaluate your requirement that it is feasible or not. We have a team of frontend expert who will contact you regarding any information about your project. He will guide you all the pros and cons about your project. 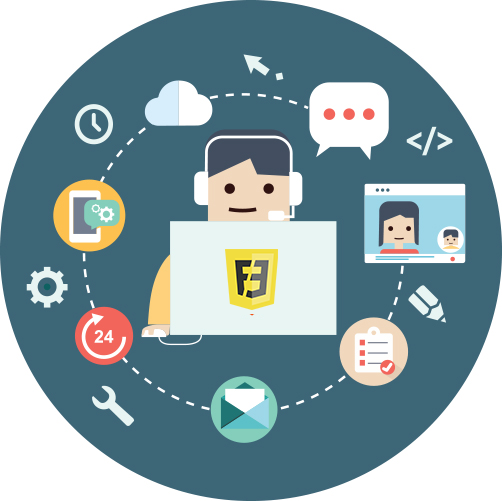 You will find a list of frontend expert on our website, where you check about the front end expert skills and select accordingly. You can call anytime on the given number and ask any questions regarding your query. After that, make online payments of working together and continue growing your business. Our frontend development team has experience of many frontend technologies like AngularJS, ReactJS, jQuery, HTML, etc. Once you hire HTML developer then you can enjoy the whole development process without any second thought. We guarantee that you will get the complete solution on the given deadline.